Magicard M9007-24/8R Lamination ribbon (also knows as overlamination) provides a layer of protection over your printed cards, making them more durable and protecting them from wear and fading. The holographic design of Magicard M9007-248/R lamination is embedded in the overlaminate and secures your cards by protecting them from tampering and counterfeiting. Note: May also be referenced as item# M9007-248R. 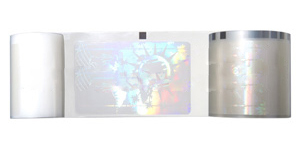 Holographic patch overlaminate roll featuring the "Magicard Design"